At this centre we aim to provide the best care possible for young people. This is because it is very important that they get the support they need if they are in a bad situation. Reaching out to seek help is proven to be the most effective way you can resolve recurring problems. YoungMinds focuses on the wellbeing and mental health of young people, they aim to foster innovation that meets the needs of vulnerable and excluded children. They also champion the voices of young people and parents to influence mental health policy and practice. They will always listen carefully to ensure that they can create solutions to your problems with you. They respect each other and thrive on diversity, and will always act in your best interests. YoungMinds are currently in the process of carrying out their strategic plan from 2016-2020. This plan includes enabling professionals, parents and young people to make informed decisions about the safe use of psychiatric medicines, influence the reformation of services so they better meet the needs of children and their families, and help young people better look after their mental health. Over 5000 young people told YoungMinds their top concerns are the impact of social media and the online world, lack of access to help, school stress and unemployment. CAMHS turns away approximately 25% of children and young people referred to them. Talk To Frank is a unique website that lets you live chat online, email, or ring in about your drug or alcohol issues. You can also find support near you simply by entering your postcode onto their website using the search box. It also supplies helpful PDFs with information about common drug and alcohol related issues, and important things you need to know about them. If you are in need of sexual health advice, screenings for STIs, free contraception and pregnancy testing or simple prevention methods and treatments of STIs, it is important that you get this information from the right place. Drop into your local sexual health clinic for professional advice from a nurse or doctor about your concerns. The national domestic violence helpline is a 24 hour helpline run in partnership with Women's Aid and Refuge. It gives help, support and information over the telephone, wherever the caller may be in the country. All calls are completely confidential. For more information see the link below. Women's Aid is a federation working together to provide life saving services and "build a future where domestic violence is not tolerated". The Brandon Centre see people aged between 14-21, you can make appointments with them at the Drum, Lift, or Platform from the contact details below. Kidscape is a website that provides professional advice for children, young people, parents, and carers to prevent bullying and protect young lives. Workshops for children aged 9-16 and their parents, teaching proven techniques to build self confidence, stay safe, and respond to bullying in practical ways. Media engagement to raise awareness about bullying and child protection among the general public. Information and advice on dealing with bullying and related problems, freely available to schools, professionals, families and children. Cyberbully Hotline is a website that lets you anonymously report online bullying. It is linked with schools, and allows students and parents to text or call in reports anonymously, it also tracks incidents simply and quickly. Problems with work, Revision Tips, Exam Stress – how to structure and balance study and relaxation. Make a schedule for yourself, include homework, revision and other outside school activities such as shopping, movie nights etc. 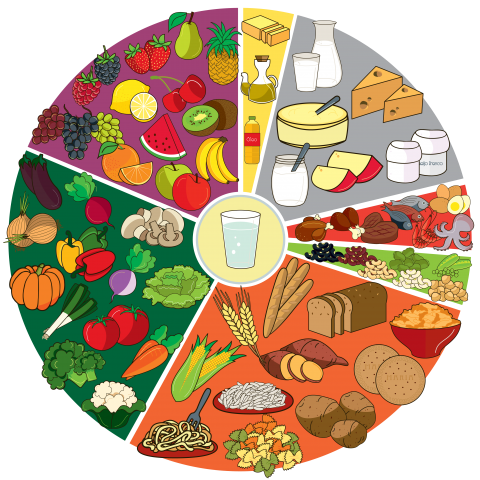 Try to incorporate exercise into your daily life, maintain a healthy diet (eating your 5 portions of fruit and veg a day, and including things from each food group into your meals) this will improve your overall well-being. Also find out about local events in Islington. If you are trying to gain or lose weight make sure you are doing this in a healthy way, by exercising regularly whilst also keeping a balanced diet. Learn how to set up and handle a bank account or even how to get a part time job like babysitting, waitressing etc. 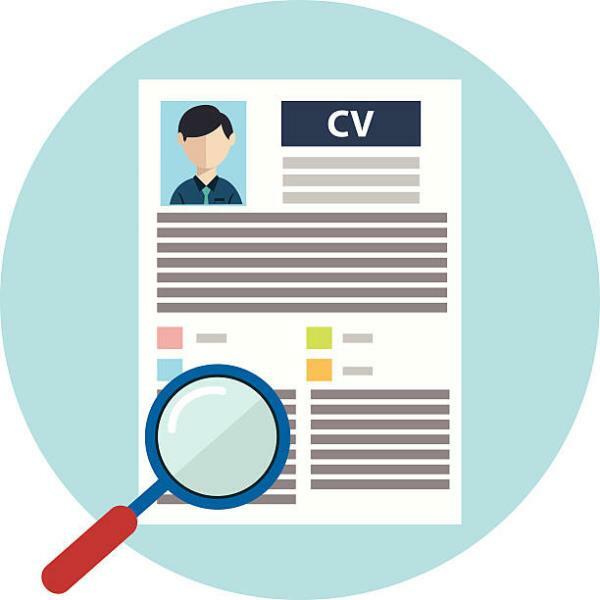 Tips for CV writing and job interviews. Be aware of your surroundings and avoid alleyways (especially at night), and of course, always try to be with a friend when walking the streets at night. Join a local boxing or self-defence class to improve your chances of staying safe if you were faced with a dangerous real life situation. Making sure someone knows where you are, message your friends and/or parents so they know your whereabouts, and always know your route home. 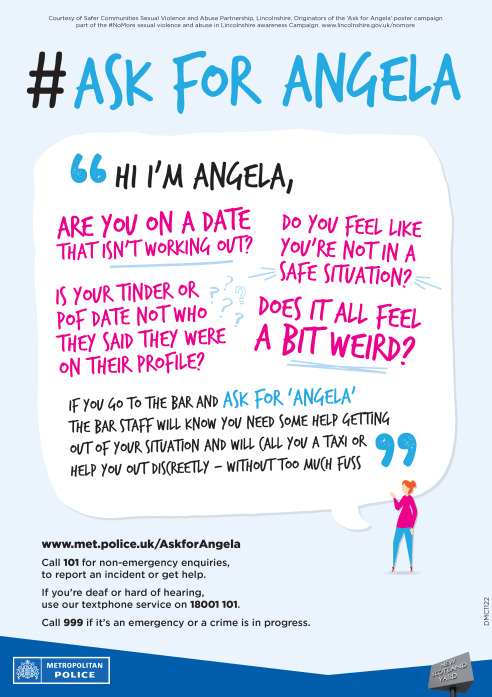 Recently a new scheme has been put in place, as part of the poster campaign for #NoMore sexual violence, among many pubs, bars and clubs called 'Ask For Angela', these posters are placed in toilet cubicles for people who feel in danger, or just a bit weird about who they are with, or what they are doing. You can go to the bar and ask for "Angela", and the bar staff will know you need help. It is very discreet and easy. If you are a student you can also get a student Oyster card, this will allow you to get cheaper travel on the underground, and can also be linked with a 16-25 railcard for even cheaper fares. Sometimes it is difficult to make decisions when you are with your friends. It's easy to agree to something you are unsure about when everyone else is doing it, but it's okay to say no. Smoking, drinking and drugs are all things that can easily be pushed upon you by others. If you need help or advice for dealing with these situations please see the links below. Kids Health is a website for teens and young people. It will help you through step by step how to say no in a situation you may usually find it difficult to. It covers many more things than only peer pressure and is a good resource for anyone who needs a little advice. Another helpful website is http://www.teensforlife.com/hot-topics/peer-pressure/ which gives advice and support for young people suffering from peer pressure and other similar issues. You can also make yourself an account on this website and join their community. Urban Hope is a youth and community project in Islington providing safe spaces, positive relationships and new experiences for young people. They want young people to reach their potential, grow up healthy, and be a part of society. If you are in need of a booster vaccination please contact us for an appointment. Check out different creative and academic opportunities near you - remember it is a legal requirement to stay in education until you are 18 years old. Have a look around your local sixth forms and colleges, and if that's not for you research internships or apprenticeships that better fit your skills. If you are worried about university remember that it's completely normal to feel this way. If you need extra support talk to your parents, or contact the university for some peace of mind. It is important to not let your worries get in the way of your opportunities. What is so good about City Road Medical Centre? Success Stories from young people who have previously used the service and have had a positive experience. Online Feedback from many of our patients has been extremely positive. Our nurses are very helpful and understanding, making sure everyone feels at ease here. Instructions on how to make a complaint if necessary. This is important as it helps the community to thrive and helps you to gain invaluable experience. Not only this, you could even add this to your CV to show yourself as a very competent candidate to a potential employer. How can I make and track my appointments? You can make an appointment by ringing us on 02073368170. Our receptionists will contact one of our doctors to ring you back shortly and book a time for you to come in. You can track your appointments easily, just ask for a copy of your appointments from your doctor. You can make a complaint by contacting us directly at the surgery, through our friends and family test or our online feedback form. How long is the approximate waiting time until an available appointment? It is usually a 2-3 week wait, but it tends to vary on the time of year. What do I have to say to a doctor/counsellor? You don't have to say anything you aren't comfortable saying to your doctor or counsellor. Everything you talk about will be kept confidential, so you don't have to worry about other people finding out what has been discussed. If you don't share your worries/problems then we can't help you, but we try our best to make you feel comfortable and relaxed when talking about your issues. 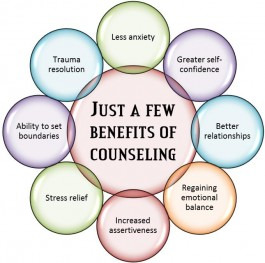 Every counselling session will be different depending on your reasons for being there, but our doctors and counsellors will always ensure you feel comfortable and at ease in your sessions. It seems like a very scary thing to do, but the results are only positive. It is proven that seeking help about a re-occurring problem is the most effective way to resolve it. As long as you are 16 or over, anyone who is not relevant will not know what you have discussed with your GP. This information will be kept completely private. Parents, family members, care workers, tutors or youth workers will not be contacted about your visit without your permission. Your doctor may talk to you about involving an adult to support you but it’s your choice whether you would like this to happen. If we think you or another person is at risk of serious harm we may need to speak to another agency, like Children’s Services. If we need to this, we will speak to you first so that you can ask any questions you may have. How long can I talk to my doctor/counsellor for each session? Each session is approximately 12 minutes long, but can sometimes be slightly faster or slower, depending on the problem. Don't blame yourself. It's not your fault, and all you can do now is try to help make things better. Ensure you always look out for symptoms if you are concerned about your child’s health. If you think their health is at risk, make sure you take suitable action by contacting us to provide help as soon as possible. If your questions haven’t already been answered, there are multiple ways that you can contact our centre. The advice given by a receptionist is completely confidential. This will be the same if you request to be put on a list to speak to a doctor or counsellor. The nearest Tube station is Old Street on the Northern Line. When leaving the station, follow the green line out of the exit. This will lead you to Moorfields Eye Hospital, and we are located a couple of buildings down from there.